General Description of a single house sewage treatment plant. Lilliput single house units, model numbers SBC2000 and SBC6000 treat sewage from an existing septic tank. The Lilliput® output is water which can be used to irrigate a garden. Process of Lilliput® compact sewage treatment plant. 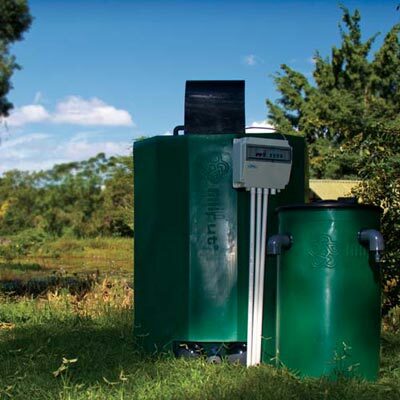 Sewage from the septic tank of a house is constantly pumped to the Lilliput® Bio-reactor. The sewage enters the Bio-reactor below the fixed-growth media, here it is mixed by the air diffuser. Effluent/ sewage now moves upward through the system where it comes into contact with the microbes growing on the growth media. This microbial population aerobically degrades and removes organic compounds within the aerated effluent. Some nitrification occurs in the top layers of the media. After passing through the media, the treated effluent is sent to a disinfecting contact tank, it is then ready for use and released to the garden for irrigation. Irrigating with the treated effluent (Lilliput® output) is completely safe and helps conserve water by recycling 100% of waste water. Lilliput® compact sewage treatment plants (SBC2000 & SBC6000) can be installed above ground to reduce costs. Installation can be discrete and incorporated into a water feature for example. A Lilliput® compact plant model no. SBC1000 requires only a 220v power supply. This sewage treatment plant is easy to install and has only basic plumbing requirements. The lilliput® compact sewage treatment plants recycle wastewater and treat sewage, they require very little supervision and are maintenance free. Pumps used are sealed and designed for continuous use. For optimum efficiency, chlorine in the disinfectant tank should be periodically topped up. Mechanical and electrical components are generic and can be purchased from your local hardware store. All materials used are non-corrosive or corrosion protected. Extensive earthworks are not necessary as the treatment plant can be constructed and installed above ground.